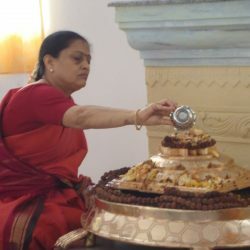 Gayatri Upasana is called Sandhya. Sandhya is sandhi in Sanskrit which means the "meeting point". The connecting point between the eyebrows on the forehead is the bridge between the dhyu loka and para loka (heaven) - a bridge between the gross and subtle. Sandhya karma is the practice that is performed at sandhi kala - the transition period between day and night. The process of crystallizing the energy and focusing the mind between the eyebrows is the main aspect of Sandhya karma. Sandhya kala (transition time) supports this process of Sandhya karma, and is not just an evening practice. The prana nadis (Ida and Pingala) and the jnana nadi sushumna the meet in the Ajna chakra, where mind principle dwells. When mind transcends, the energy flows through the ida and pingala nadis, and it experiences the sensual pleasures. When the same mind ascends and goes beyond the Ajna chakra, it enters the Sushumna nadi and the mind experiences supra sensory experiences. The meeting point of these three nadis between the eyebrow centre is referred as Trikoota in yoga shastra. The Sushumna nadi is called Vaishnavi nadi in Yoga Shastra because it leads you to the Vishnu state. The goal of mantra is to attain the Vishnu state.